• "An Arch Rebel Like Myself": Dan Showalter and the Civil War in California and Texas by Gene C. Armistead and Robert D. Arconti (McFarland, 2018). Like many of his countrymen, Pennsylvania's Daniel Showalter moved to California for the opportunities it had to offer, eventually settling in Mariposa County. A gold miner at one time, he also entered state politics. Despite his northern birth, Showalter aligned with Southern Democrats and became a vocal proponent of California leaving the Union. While the Broderick-Terry duel is one of the most famous fought west of the Mississippi, Showalter participated in California's last political duel, killing fellow Democrat Charles Piercy in a dispute over secession. A fugitive, he was caught and imprisoned. Upon release, Showalter traveled east to Texas, where he obtained a commission with the 4th Cavalry regiment of the Arizona Brigade. His Civil War service with the 4th Texas consisted mostly of fighting Indians on the frontier and repelling various Union incursions along the state's borders. 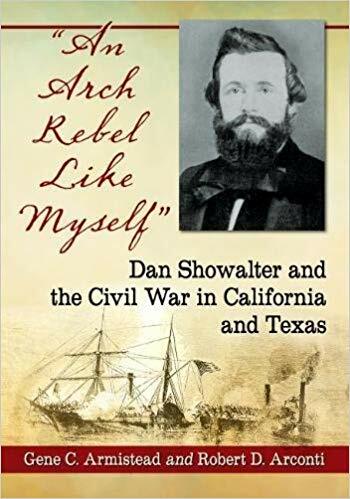 This story is told for the first time in comprehensive fashion in Gene Armistead and Robert Arconti's "An Arch Rebel Like Myself": Dan Showalter and the Civil War in California and Texas. Trans-Mississippi titles have been really scarce this year, and I am looking forward to this one. In addition to being the first substantial biographical treatment of Showalter, the book promises insights into the wider spheres of secession politics in California and the domestic military situation in Texas during the Civil War.